I normally like to use Twitter straight from the browser but there are some really good Android based apps that work just as well. 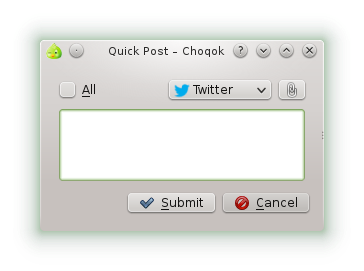 Choqok is a Twitter client for Linux that is installed by default with the openSUSE KDE live DVD. This article looks at the features of Choqok. When you first run Choqok it isn’t immediately obvious how you link it to your Twitter account. In order to do so select “Settings -> configure Choqok”. To add an account click “Add” and then select “Twitter”. 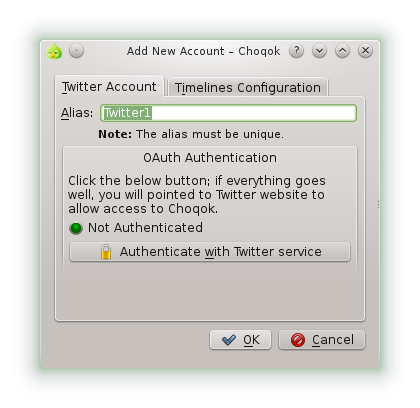 You can enter anything as an alias but to link to your Twitter account you need to authorise Choqok to access it by clicking the “Authenticate with Twitter Service”. Once you have authenticated Twitter you will receive a code that you have to enter into Choqok. There really isn’t much to Choqok, which is actually a good thing. The main window loads with the tweets from the people you follow. You can post a new tweet yourself by clicking on “Quick Post” on the toolbar. The timeline will by default update after 10 minutes. If you want to load new tweets before that, click on the “Update Timelines” icon on the toolbar. 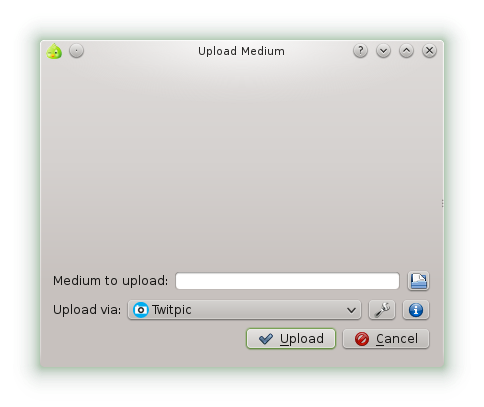 If you want to post an image then you can use the “Upload Medium” button on the toolbar. A new window will appear and you can choose the file on the disk that you wish to upload and the service you want to post it to. If you want to see your mentions, inbox or outbox you can click on the icons on the left side of the screen. The strength of Twitter is obviously by the use of hash tags. To search for a hash tag click on CTRL and F.
Enter the search term into the query window and your timeline will be replaced with a list of tweets containing that search term. 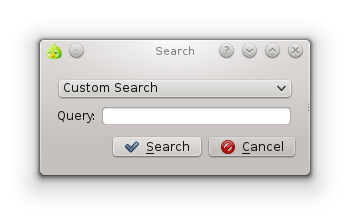 As with all the KDE applications, Choqok has a host of configuration options available. 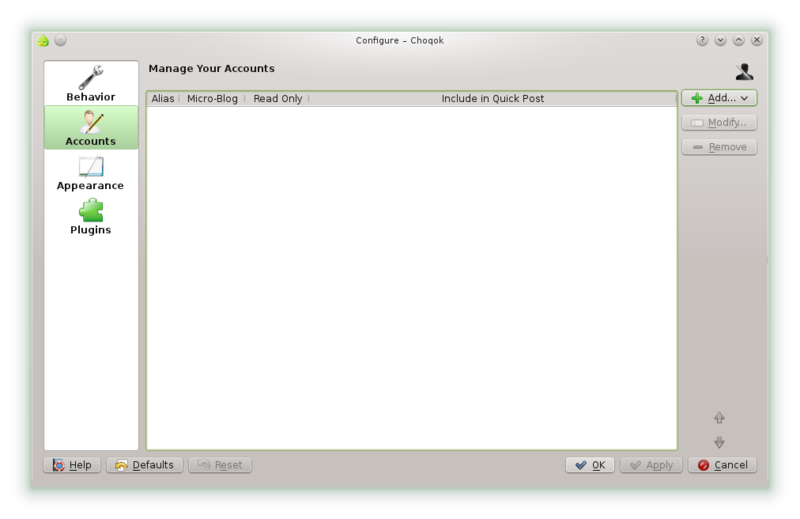 The configuration options can be found under “Settings -> Configure Choqok”. The behaviour settings let you determine how to deal with posts, whether to automatically spell check tweets, set how long it is before the timeline updates and the number of posts to show. The accounts screen lets you add different Twitter accounts. The appearance screen lets you reverse the order of tweets, and customise the appearance such as changing the colours and fonts. 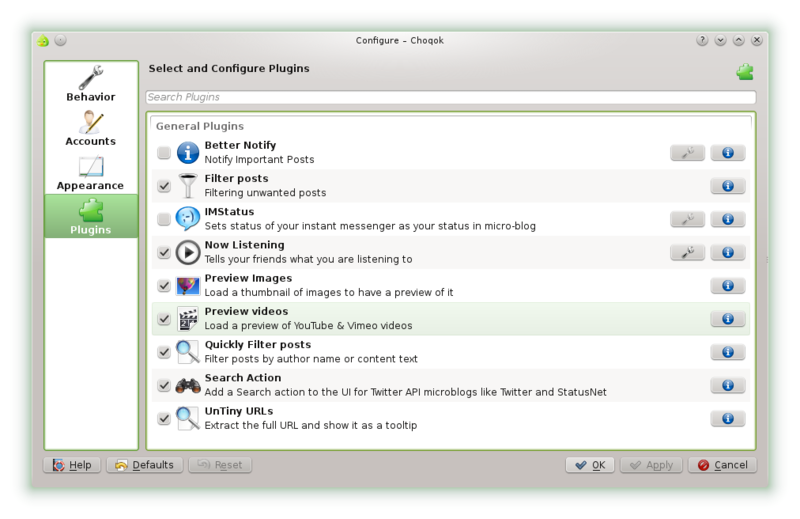 Choqok also has a number of plugins available. Many of the plugins are selected by default such as the ability to see images and videos, and the ability to extract URLs as the full URL instead of the shortened version. 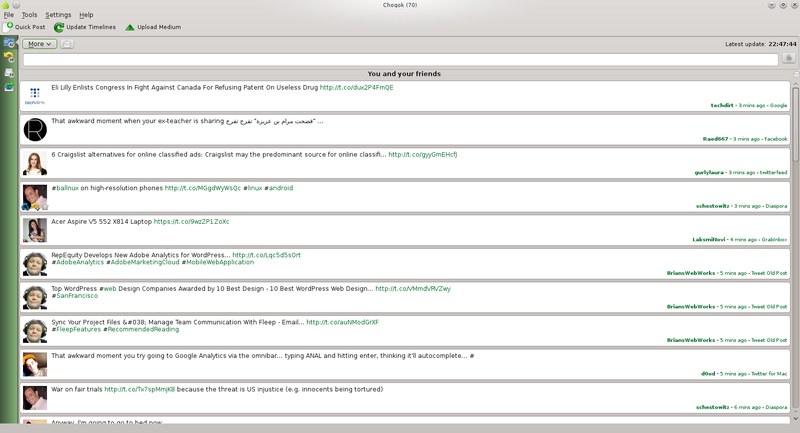 Choqok is a very good Twitter client and it has a light feel to it. It is much easier to read the tweets and search for tweets using Choqok than using the Twitter website itself. If you are already using KDE then you will probably have Choqok already installed but if not, it will be in the repositories of the version of Linux you are using. I like some KDE programs, but why must they all start with "K". It gets confusing. So, you're posting this complaint on an article about a KDE app that doesn't start with "K"? As a newbee, can someone tell me how to clean out my 'inbox'? I have 800 messages and I'd like to keep just the current 15 or so, from the last 24 hrs. Any way to delete messages?